At medium heat and using a frying pan [with a lid] add the onions and garlic and sautee until the onion is browned. Add the ginger and tamarind [again optional] and all of the spices [you can add about a quarter cup of water to the spices before you put them in]. Or you can add the spices to the mixture and then add water. This is so it does not burn. Now when the water has evaporated and only the oil and spices are left, add the potatoes and salt and add a little more water [1/4 cup] and cover and let cook under low heat. Once the potatoes are almost cooked through, add the chick peas and cover and cook until they brown. Turn off heat, garnish with the cilantro and enjoy. I recommend that you make a salad on the side [like avocado salad] and serve the chick peas in bowls with puffed rice sprinkled on top and lemon wedges for extra sourness. For me this is too sweet and not spicy enough (?) Otherwise, it was delicious! For futuur yesterday. You can make it spicier–add green chilly or even bump up the amount of the red chilly powder. I like it mild, so i really enjoyed it. I’m so glad you wrote this down, Lamya! I asked Fatuma to help me write it down once and then I misplaced the scrap of paper I had scribbled it on. I’m so excited to make it! 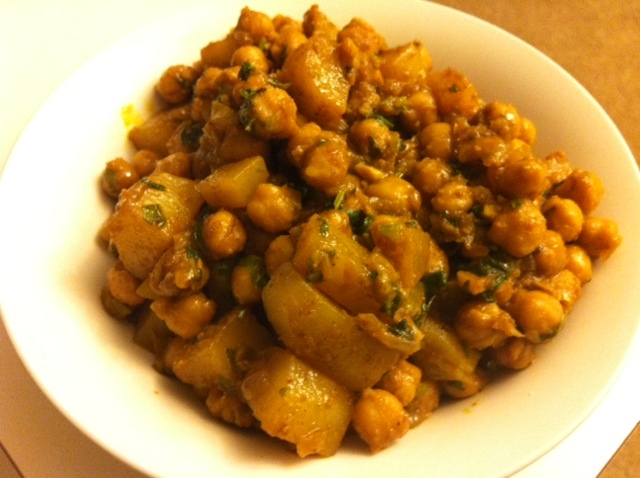 I made it for dinner last night and Ma sha Allah it’s another great tasting recipe of yours ! I would love to share some of your recipes on my blog this Ramadan in sha Allah.